This first machine cancellation of machine “B” has not a serial letter, but has – in contrast to machine “A” – the country name in the old orthography: LATWIJA. In the tables of von Hofmann and Juris Mors this machine cancellation is indicated as M-05-B. The first reported date of this cancellation is 28.V.21 and the last date is -5.IX.21. The stamps Michel 42-45 has the same design: Mother Latvia in national costume guiding the nation at the helm of the ship of state. 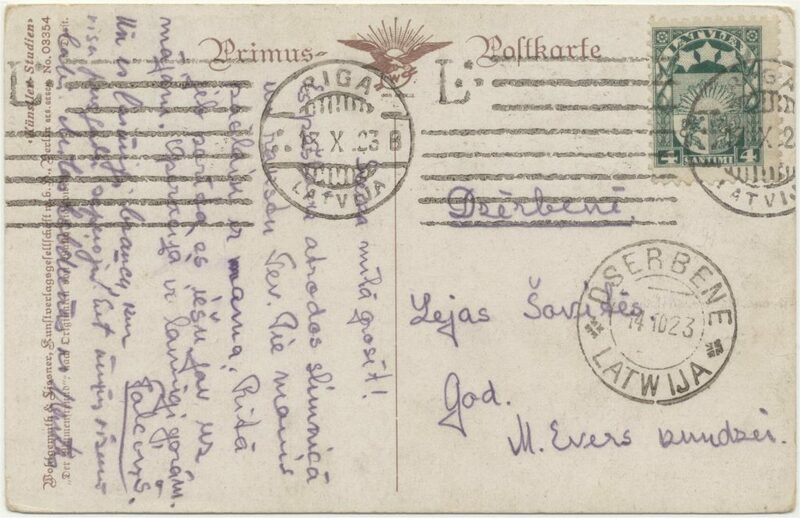 About these postage stamps see: The postal and monetary history Latvia / N. Jakimovs en V. Marcilger. – 1991. – p. 3-49/50. 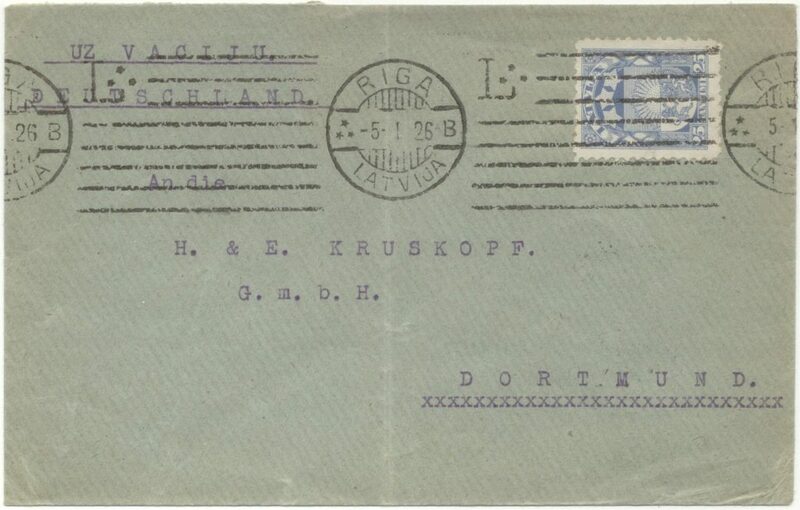 Lettland : Die Briefmarken in Rubel-Währung 1918- 1922 / Harry von Hofmann (red.). -(Handbuch Philatelie und Postgeschichte) Hamburg : Harry von Hofmann Verlag, 1998. – p. 148-153: First Constitution Assembly. The postage stamps Mi. 42-45 are designed by Prof. Richard Zariņš, one of the best-known Latvian graphic artists. 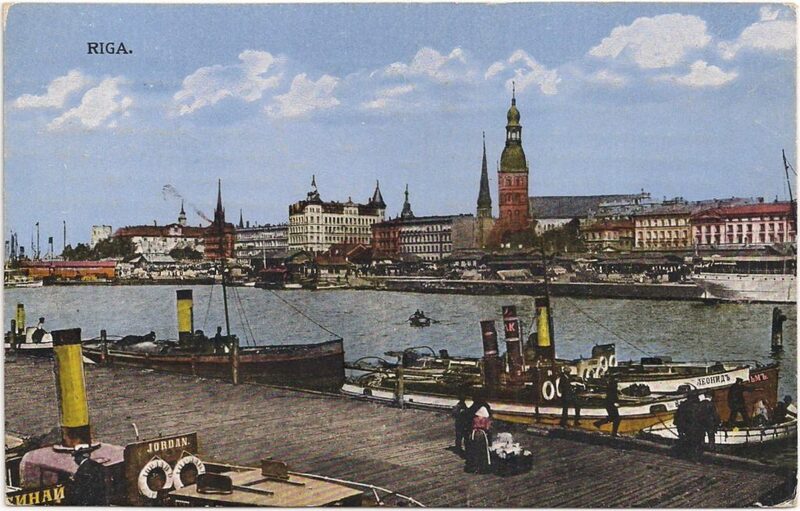 The other side of the card with a view on Riga. The postage stamp is Michel 45A, issued May 14, 1920. The date in the datestamp is 30. V. 21. 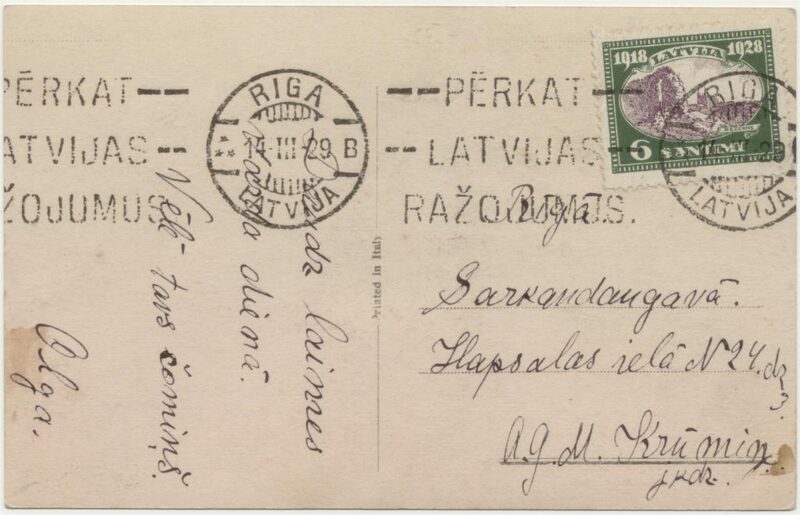 The postage stamp is 5 rublis: between 16-05-1921 and 01-01-1922 is 5 Latvian roubles the rate for an international postcard. Between 30 April and 17 May 1920 were issued four postage stamps (Mi.42-45) to commemorate the First Constituent Assembly. 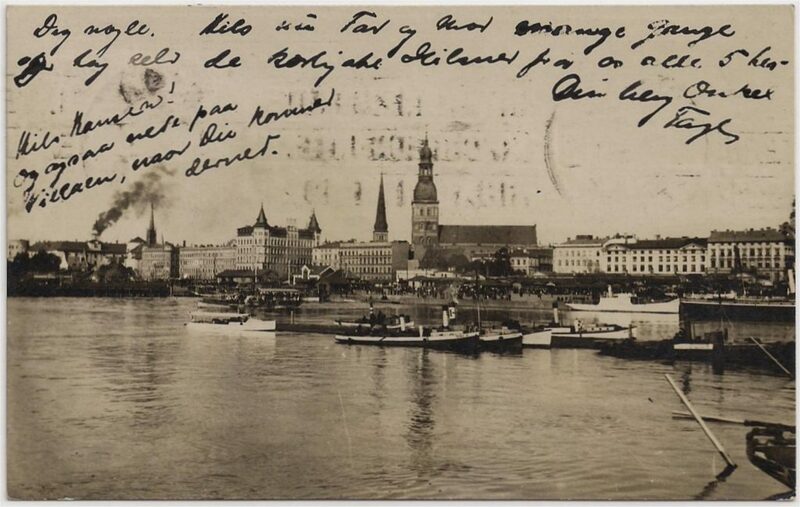 In January 1920 the Soviet Latvian troops were defeated and on 1 May 1920 the Latvian Constituent Assembly convened. The Assembly had 150 members. J.Čakste was elected President of the Assembly and of the Republic. K. Ulmanis was asked to form a Cabinet of Minsters. M-06-B is a machine cancellation with ‘L’ (3 mm indented) and three stars before the 3 upper shorter lines (like M-08-B below). Thereunder 5 lines longer. 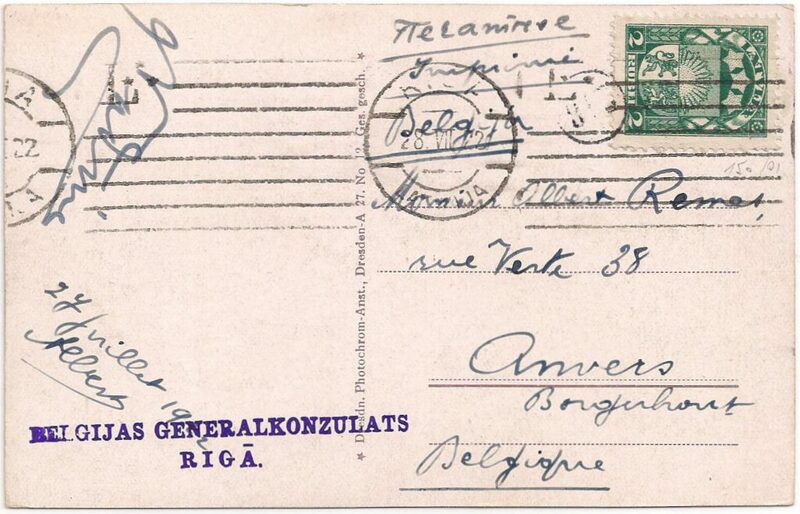 In the datestamp the country name is also in the old orthography (LATWIJA), still without serial letter. See card here below. First and latest reported days: -9.IX.21 – 13.XI.22. The cancellation is used simultaneously with M-07-B. In the tables the machine cancellation on this card below is M-07-B. 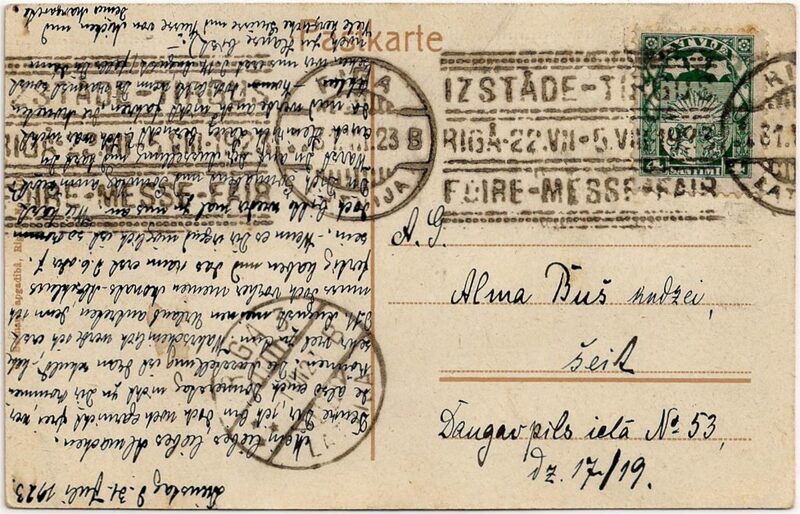 Datestamp: still without serial letter, the country name is also in the old orthography (LATWIJA). First reported date is -3.III.22, last date is -6.VII.22. M-08-B is a machine cancellation with ‘L’ (3 mm indented) and three stars before the 3 upper shorter lines. Thereunder 5 lines longer. 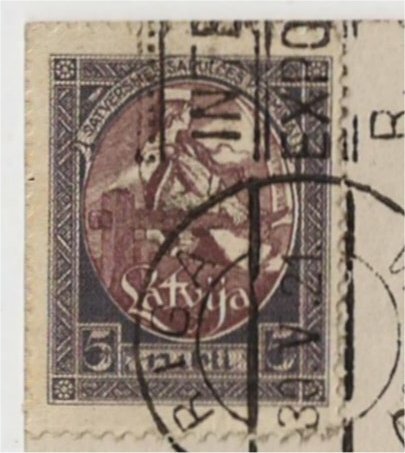 In the datestamp the country name is in the new orthography (LATVIJA), with serial letter B, with 9 segment bars in the segments above and below. First reported date is 14.XII.22, last date is -6-XI-25. M-08-B is used simultaneously with M-09-B, M-10-B, M-11-B and M-12-B. There is a machine cancellation like this, but then the ‘L’ is placed more left (left as the last 5 lines, not indented): M-13-B. M-09-B is a machine cancellation with the text IZSTĀDE – TIRGUS RIGĀ-22.VII-5.VIII-1923 FAIRE-MESSE-FAIR (Exhibition – fair Riga 22.VII-5.VII-1923, the last line FAIR in French, German and English) , serial letter B. In the text FAIRE is an error: it must be FOIRE as on the card below. First and last date: 25.IV.23 – 10.V.23. 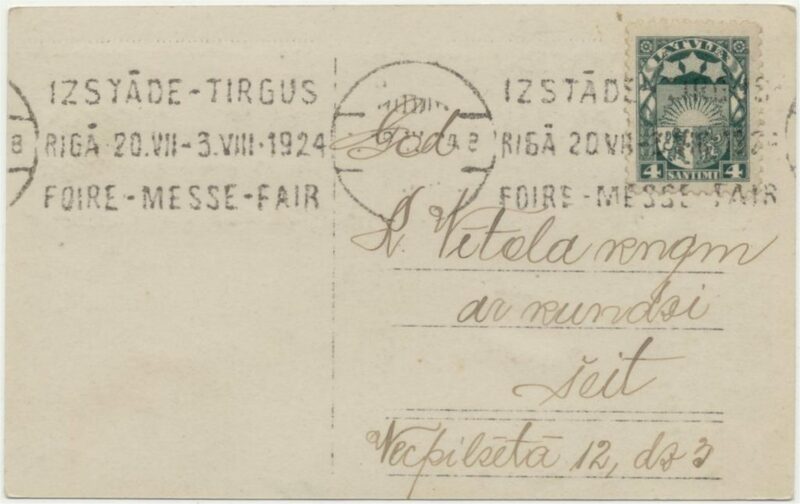 Card with the machine cancellation M-10-B with the text IZSTĀDE – TIRGUS RIGĀ-22.VII-5.VIII-1923 FOIRE-MESSE-FAIR (Exhibition – fair Riga 22.VII-5.VIII-1923, the last line FAIR in French, German and English) , serial letter B. The first reported date is 11.V.23 and the last date is -7.VIII.23. 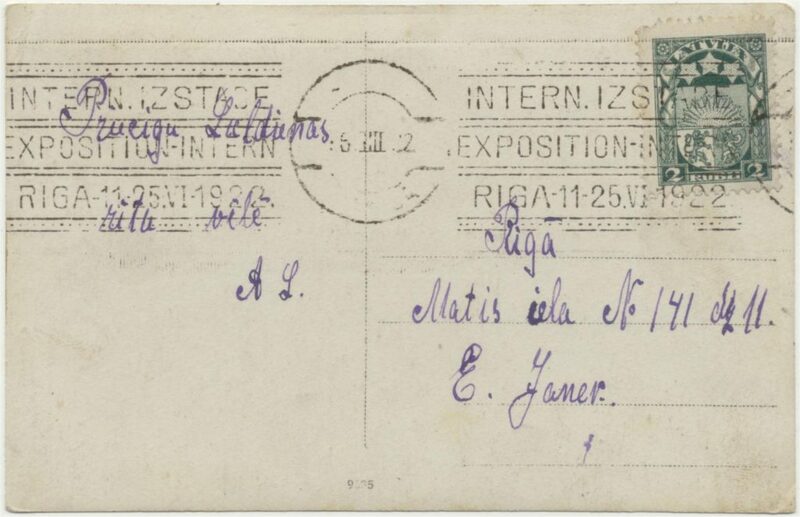 Card with the machine cancellation M-11-B with the text IZSTĀDE – TIRGUS RIGA-20.VII-3.VIII-1924 FOIRE-MESSE-FAIR (Exhibition – fair Riga 20.VII-3.VIII-1924, the last line FAIR in French, German and English) , serial letter B.
Juris Mors makes a difference between M-11-Ba (RIGA = 11mm) and M-11-Bb (RIGA = 13 mm). First reported date of M-11-Ba is -7.II-24 and the last date is 28.IV-24. First reported date of M-11-Bb is 29.V.24 and the last date is -1.VIII.24. Again a machine cancellation with ‘L’ and three stars in the flag and also serial letter ‘B’, but now the ‘L’ more left in the flag , almost even left as the long lines. In the tables this is M-13-B. The (reported) use: 16.XI.25 until -5.II.29. 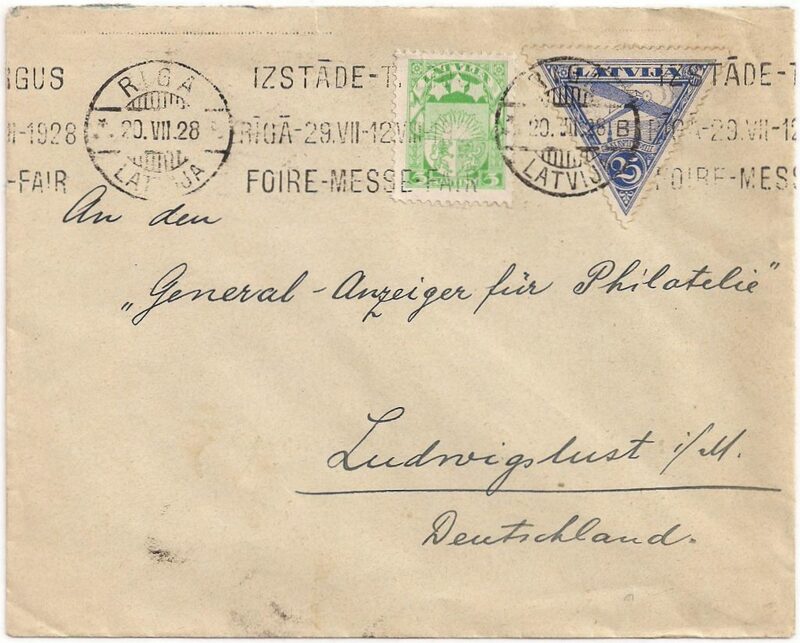 The cover has something philatelic: to the ‘General-Anzeiger für Philatelie’, the General-Gazette for Philately in Germany. This magazine is in 1883 for the first time issued and was at that time the first postage stamps magazine in the world. Christian Sauerland from Hemer, a little place in western Germany, made this first issue when he was 24 year. 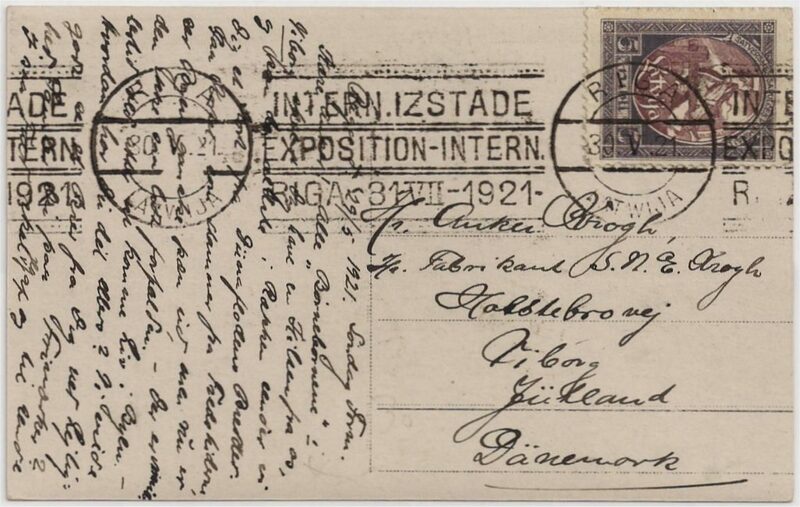 In 1908 the publishing house moved from Hemer to Ludwigslust (address on this cover). 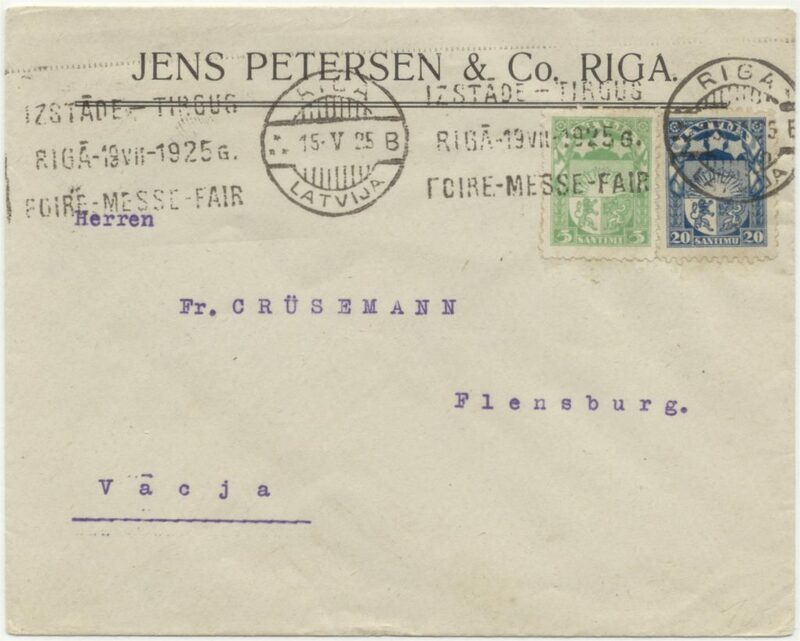 Here the last postmark of the first period with serial letter ‘B’, in the tables M-15-B. Text in the flag: PERKAT LATVIJAS RAZOJUMUS (Buy Latvian products). The first reported date is -5-III-29 and the last date is 13 XII-29.